Warwickshire County Council cabinet approved plans for 31 families to be homed across its five boroughs and districts when it met on Thursday. Of this number, Rugby had already agreed to take up to ten families following a decision made by Rugby Borough Council at a special meeting on March 1. But at last week’s county cabinet meeting, frustrated members said they needed to step up and do more for desperate people fleeing war-torn Syria in the coming years. Cllr Philip Johnson (Lab) told members: “I think these figures are disappointing and unambitious of this council. “We are taking in one family per district per year. Other places are projecting to take on hundreds of people and we are talking about 31 families. “We are a relatively wealthy area and these people are not in a good place. 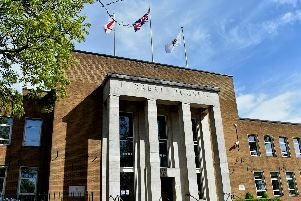 Conservative council leader, Cllr Izzi Seccombe said numbers were limited by what the housing authorities – such as Rugby Borough Council – would approve, but urged cabinet members to work to try and boost these figures. She said: “I could not agree more with what has been said. We are in effect the legal authority here but a lot of this needs to be looked at with our housing authorities. “My heart sinks when I see these figures but I ask that all of us use our influence on the district and borough councils to encourage talks. The council must take refugees as part of the Government’s resettlement plan to bring 20,000 people to the UK. The scheme includes funding up to £11,000 per child over a resettlement period.